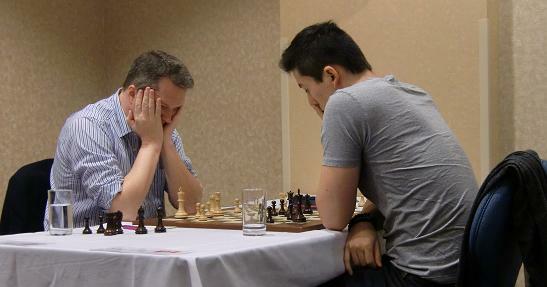 The Canadian Chess Open 2013 took place 13-20th July at the National Hotel and Suites Ottawa in Ottawa, ON. The tournament saw a very intense fight for first place with strong players such as Nigel Short, Lazaro Bruzon and Ivan Sokolov aiming to get a big payout. These strong GMs were joined by young and ambitious Canadian players, such as GM Eric Hansen and IM Aman Hambleton. Former world chess championship challenger Nigel Short showed his class and finished the event with six wins and three draws, but he had to wait for the organizers to calculate the tiebreak scores to get the winner’s title, as GM Eric Hansen achieved the same score. Both players received the same money prize, $4.000. Five players shared 3rd-7th place after getting 7 points: Lazaro Bruzon, Ivan Sokolov, Aman Hambleton, Edward Porper and Arthur Calugar. Full standings below. The tournament took place in our capital, a quiet city. Because there were not many distractions, I was pretty focused on my tournament games. I managed to play solid and take advantage of my opponents’ mistakes for most of my victories. This is my last tournament in Canada before moving to Spain so It’s nice to leave on a good performance. Now, I will focus all my attention to preparation for the World Cup. I was a part of the organizing team for the tournament, my job being the Elite Player Coordinator in charge of the foreign invitations, VISA’s, conditions, etc. I thought the tournament was a great international look for Canada, with some near-2700 level participants (Nigel Short, Lazaro Bruzon, Ivan Sokolov). I found the tournament to have a nice schedule, very relaxing one game/day for the most part and it allowed time for most players to visit the many tourist sites in Ottawa, especially Parliament Hill. For me, it’s not an issue since I am living in Ottawa! GM norms were possible, but unfortunately the GM’s in the tournament were not doing so well so even though I had 5.5/7 I only played an FM in round 8. I was close to making a GM norm, with performance near 2600 and 7/9 but I had only played 2 GM’s. For a big Open of 200 participants, I think the Organization did a good job keeping the spectators up to date with pairings, as well as a very detailed Multimedia page with postmortem videos and pictures from the rounds.